Trayvon Martin's father quietly left the courtroom after police photos of his son were shown to the jury. George Zimmerman has pleaded not guilty to second-degree murder in the shooting death of Martin. NBC's Ron Mott reports. The jury in the George Zimmerman trial was shown photos of Trayvon Martin’s body and a closeup of a chest wound as a police sergeant testified Tuesday about his attempts to save the teenager’s life. Sgt. Anthony Raimondo of the Sanford, Fla., police department told jurors how he arrived at the shooting scene, in the evening drizzle, on Feb. 26, 2012, to find Zimmerman handcuffed by another officer. Martin’s body was on the grass, face-down with his hands under him, Raimondo said. He said he checked the 17-year-old for a pulse and found none and then turned him over to perform CPR. “I breathed for Mr. Martin -- or I tried to,” Raimondo said, adding that the other officer performed the chest compressions. Editor's note: Photos from the crime scene, which some readers might find disturbing, are included below. Raimondo said there was a bubbling noise – the sound of air escaping from the chest wound -- and he asked for plastic wrap and Vaseline so he could create an airtight seal around it. A passerby brought him a plastic bag. The sergeant testified that he sat the body upright to feel for an exit wound and felt a cold can in Martin’s hooded sweatshirt pocket – the Arizona brand fruit drink he had purchased at a 7-Eleven where he also bought Skittles for a his father’s girlfriend’s young son. 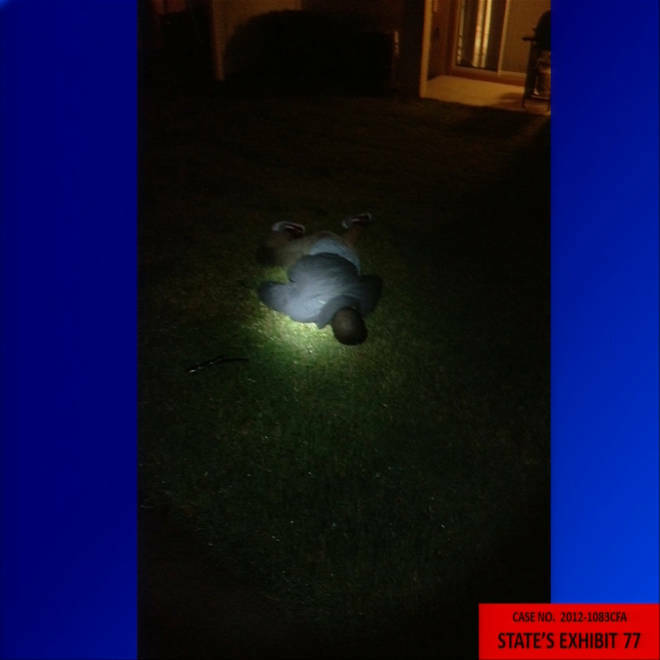 This crime scene photo presented by prosecutors for the State of Florida shows Trayvon Martin's body from the night of the shooting in February 2012. The photo was entered as evidence during George Zimmerman's trial in Seminole circuit court June 25, 2013 in Sanford, Fla.
Raimondo laid the body back down to continue CPR, but could not revive Martin. After a rescue crew arrived and pronounced Martin dead, Raimondo put an emergency blanket over the body, he testified. While the 14-year veteran was on the stand, prosecutors displayed pictures of Martin’s body face-down on the grass, face-up after the CPR attempt, and under the emergency blanket, with his foot sticking out. There was also a photo of what appeared to be a coin-sized chest wound. Martin’s father left the courtroom as the pictures were shown. Later, as crime scene technician Diana Smith testified, jurors also saw pictures of injuries to Zimmerman’s head and face. They were also shown Zimmerman’s 9mm gun and the items Martin was carrying, including the Skittles. It was the most graphic evidence to date in the trial, which began in earnest Monday with opening statements. Zimmerman has pleaded not guilty to second-degree murder, claiming he shot Martin in self-defense after being attacked. Selene Bahadoor, who lived in the condo complex where the shooting took place, told the jury she was in her kitchen when she heard the sound of someone running from left to right. She looked outside, saw two upright figures, with arms flailing and heard someone shout something that sounded like, “No,” and then heard a neighbor ask whether he should call the police, she testified. She said she went to the stove to turn it off, heard a shot and returned to her sliding glass door to see a body on the ground. On cross examination, defense lawyer Mark O’Mara repeatedly asked Bahadoor why she had not mentioned the direction of the initial running she heard in any of her previous statements or depositions, eliciting some long pauses from the witness. “I know I must have mentioned it -- it’s just not in the transcript – because that’s what I remember,” she said. O’Mara also questioned her about why she had “liked” a Facebook page titled, “Justice for Trayvon,” signed a Change.org petition seeking Zimmerman’s arrest, and given a television interview about the case. She told O’Mara she was sympathetic to both sides of the case. Sanford Police Department civilian employee Wendy Dorival testified that she helped Zimmerman set up a neighborhood watch after a rash of crimes in his development. Under questioning by prosecutors, Dorival said watch volunteers were intended to be the “eyes and ears” of law enforcement and were instructed not to follow or confront anyone suspicious. Dorival also testified that she tried unsuccessfully to recruit Zimmerman for a more intensive Citizens on Patrol program because she found him civic-minded and professional. Donald O’Brien, the president of the homeowners association of the gated community, testified that Zimmerman had spearheaded the push for a neighborhood watch. “He was running it,” said O’Brien, who did not think the volunteer program was necessary. Meanwhile, the judge still has yet to decide whether another potential set of evidence will be presented to the jury. Prosecutors want to play for the jury five calls that Zimmerman made to a non-emergency police dispatcher between August 2011 and Feb. 2, 2012 to report people or activity he found suspicious. They say they would give the jury insight into Zimmerman’s state of mind but the defense says they are irrelevant. The judge has not yet ruled. Editor’s note: George Zimmerman has sued NBC Universal for defamation. The company has strongly denied the allegations. 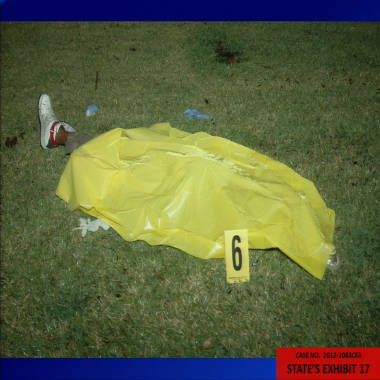 This crime scene photo presented by prosecutors for the State of Florida shows Trayvon Martin's body from the night of the shooting in February 2012.